Physical Description: The spectacled caiman, which is also referred to as a common or white caiman, derived its name from the lighter coloured ridge bone which is noticed on their face, resembling that of an actual pair of spectacles. These caimans can grow, measuring from the start of its snout to the tip of its tail, between 2 and 2.5 metres long while in rear instances can grow to an astonishing 3.5 metres. Juveniles are yellow in colour and black crossbars are seen on their bodies. An amazing trait of this remarkable species is that they are able to alter their colour in colder weather appearing darker. This is a result of the expanding of the black pigment cells found on their skin. Their tough armoured skin roofed with spikes aids in protection from other animals such as jaguars and larger carnivores. Their webbed feet make them extraordinary swimmers. Distribution/ Range: The spectacled caiman prefer to live in lowland freshwater environments where it is muddy for example swamps, lakes, roadside ditches, streams, marshes and rivers while they are able to endure saline water. This flexibility makes these individuals the most abundant species existing. These species of caiman seldom depart from their water source unless they are forced to naturally (e.g. drought) or due to anthropogenic sources, when they do this they are usually found buried in the cool damp mud. These species are usually found in Trinidad and Tobago, northern Argentina, southern Mexico and southern Florida. Threats: In recent times the main threat to the adult spectacled caiman is humans since they are the top predator of the food chain for their habitat. They are hunted for their meat and skin. 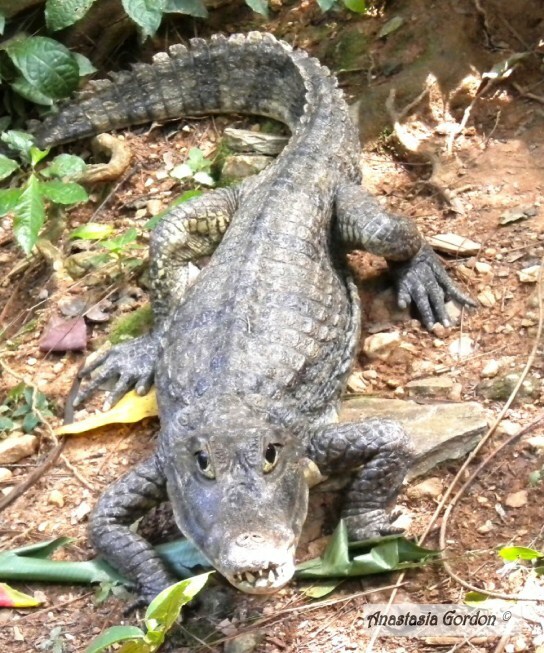 An adult caiman is hardly prone to predation from other wild animals but juveniles are not so lucky. From the egg stage until approximately 1 year of age, they are threatened by larger mammals, large birds such as hawks and other species of crocodiles. This is minimised by the watchful eyes of nearby parents. Legal Status: The Caiman crocodilus is listed as a partially protected species under the Draft Forest Protected Areas and Wildlife Conservation Bill.